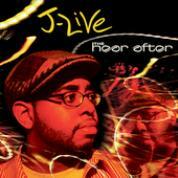 RapReviews.com Feature for September 6, 2005 - J-Live's "The Hear After"
Personally I refer to him as The Other Live Guy With Glasses, but since personal pet names have no place in an informative, objective review, I'll just call J-Live a unique combination of a rapper's rapper and the rapper next door. Take his vocal tone. He can sound conversational and self-absorbed at the same time, surrounding himself with both the remote mystique of the MC and the close by commitment of a mentor. Take his delivery. It comes across incredibly effortless, but try to dissect it and you're bewildered by the involved pace and the intricate way in which he weaves his lyrical web. Take his career. He's traveled a particularly rocky road, but always seems to be able to bounce back with a thoroughly solid release. Take his subject matter. He is playful enough to engage in verbal wit, yet serious enough to address the plight and strife of the common man. J-Live is the type of rapper who will lace his criticism of the Bush administration with Mobb Deep and A Tribe Called Quest references. He's the self-described Triple Threat, who emcees, deejays and produces. The "life-savin', murderous wordsmith," who confidently claims, "You can't call yourself hip-hop if you don't know me," and adds, "For those of y'all that don't know, to know me is to love me." throw it on loud late and wake up your neighbor"
This is the audio visual for all of y'all"
I close my eyes and listen to the words like advice from somebody I respected"
It's evident that J-Live is not an actor, in neither sense of the word. He isn't trying to be someone he's not. And he often assumes the role of an observer, whose job is not simply to report what he sees, but to offer his take on the events. As he says in "Here": "Actor not, but still this man of action stock / wisdom by the barrel and the lock and key." One cut where this all comes together is "The Sidewalks," produced by Live as a throwback to pre-sampling, mid-'80s New York rap, a gruff surface backed by an ominous boom. Starting off with a Raekwon reference to relate how he DIDN'T "grow up on the crime side, the New York Times side" like the former, J-Live walks us through his birthplace New York as well as his new home Philadelphia, offering the unique perspective of someone who may not always be in the midst of action, but who you can count on keeping score. J-Live is certainly all talk AND all action when it comes to rating himself above rappers he considers below himself. While there is no song specifically concerning competition, he always finds time to address what he thinks is wrong with rap music. He dubs himself "the oldest rookie, the rap Satchel Paige," who's "pitchin' the heat, exposin' major league heavy hitters." He wants to be "more than a mere sayer of rhymes / I'm a purveyor of fine lines / and a slayer of swine minds." He promises music "that's gon' kill ya if it don't heal ya." In fact, if he's to be believed, he's nothing less than our savior: "Y'all need somebody on the mic that'll tell it like it is, was and will be / even if it kills me / something that'll still be / cool when it's no longer hot / picked up years after it's dropped / by those who love hip-hop." It's easy to like J-Live. He's one of the good guys. And because those tend to finish last, he has the added bonus of entering the race as the underdog. With his flow matching his music probably better than ever, it's even harder not to like J-Live in 2005. Still, there might be things not to like about "The Hear After." "Do My Thing" occupies the place as promotional guest spot for label mates Cvees (who admittedly have been with Triple Threat Productions since "The Best Part") too obviously. There's nothing inherently bad about the track, Probe DMS serves up a bouncing beat in the vein of Jellyroll or Blaqthoven, only more natural. Rappers Swave and Ike engage with Live in a true-to-life cipher, but they bring a menacing aura to the album that doesn't fit with the overall vibe. J has to take the full blame for "Brooklyn Public Part 1," a potentially great song about his experiences as a teacher that inexplicably gets cut short as the plot begins to thicken, probably to be continued on a later album. Simply fading to black, not even ending the tale with a cliffhanger is extremely bad judgement, and instead of biting EPMD for "Do My Thing," he had better taken a clue from Erick and Parrish's "Jane" series of stories. I'm just amped to be kickin' and recordin' this"